After having owned and driven the previous 3 generation of the Miata, I am glad to say with the 4th generation, Mazda improved what we already thought was difficult to improve upon. This little car is small, and fun to drive and it puts a big smile on your face each time you take it out. This current version is set up slightly softer, hence it provides a more comfortable ride along Singapore expressways, but it does feel like it rolls in the bends, especially on the smaller twisty roads. But overall great car, a lot closer to the original 1st Gen Miata. The weight and the size are just perfect now. If I have to really find a complaint, there are no glove box and the boot is slightly small. The biggest problem is while the 1.5L can be currently purchased for slightly over $110K, but it's available from PI only. Get the agent car and that will set you back way way more expensive.. Too expensive in fact, even for a 2L version. It just doesn't make sense at those prices. I owned an NC 2005 MX-5 until June last year. It was great fun. Simple. Reliable. Playful. Great-sounding. Cheap interior plastics but very well-built. So I was looking forward to the ND series. The car surprised me and not all of it was good. Read my likes and dislikes below for a summary. 1. The way it looks inside and out. More aggressive and less feminine now. 2. Much improved interior plastics. 3. Bose speakers in the headrests. 5. Relatively affordable for an open-topped sports car built on a purpose built platform. 6. Small-sized the way a proper sports car should be. 9. The roof - being lighter and shorter - is now much easier to raise. 10. Handles well but still rides with a well-damped firmness. 11. Mazda build quality. Everything feels solidly put together. 12. The wheel arches are now correctly sized. Mazda cars tend to have gigantic wheel arches that make even big wheels look small. 1. The body rolls more than expected. 2. The electric steering lacks feel. 3. The engine doesn't sound that great. 4. Stubborn Mazda still refused to give it at least 200 bhp. BBR of UK managed to extract 190 bhp from this engine without turbocharging. 6. Irritating removable cup holders. 7. Top of windscreen is now too close to the driver's forehead. 8. Roof is so light that now it doesn't drop down and lock in place automatically like in the old car. You have to reach over and push it down. 9. The seat is still mounted too high! It needs height adjustment. It needs to drop down another 1.5". 10. The brake pedal now feels soggy. The old one was firm and solid underneath your foot. 11. What happened to the old car's twin exhausts??? This is a sports car. How can you only have the exhaust on one side? BBR of UK fortunately has an aftermarket twin exhaust system that looks the part. - The driving of it, especially when open-top. - Quick and easy seat hood cover, even though it is manual. - Rubber pedals. Should be alumnimium pedals instead. - Auto start-stop works properly only when air-con is off. Otherwise it always fire prematurely before the brake pedal is lifted. Have been looking forward to giving this car a try, and i was no disappointed. It's been very heavily anticipated, and the reviews so far all seem very good, so i was looking forward to trying the car. It's a wonderful thing to drive. I drove a friend's previous gen mx-5, and i remember how happy it made me feel. And this car feels the same. It's driving characteristics are awesome, handles well, very stable, comfortable when you need it to be. And the joy of driving a roadster will never subside. its actually quite well equipped for a sports car. There's a very usable touchscreen, even cruise control and what not. So i think it's actually a very usable everyday car. the striking exterior of the car may not be for everyone's tastes, especially if you like the older, curvier models. That being said, i felt that it definitely grew on me, the more i looked at it the more i loved it. Authorised Distributor Mazda cars are Mazda 2 Hatchback Reviews, Mazda 2 Sedan Reviews, Mazda 6 Reviews, Mazda 6 Wagon Reviews, Mazda CX-3 Reviews, Mazda CX-5 Reviews, Mazda CX-9 Reviews, Mazda MX-5 RF Reviews. Parallel Imported Mazda cars are Mazda Axela Diesel Reviews. sgCarMart is the number one car site for buying Singapore cars, including new cars, parallel import cars, Toyota, Honda, Nissan, Volkswagen, Mitsubishi & BMW. 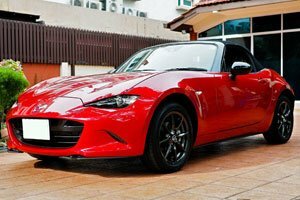 We have new car dealers comprising parallel importers, authorised car distributors, and used car dealers who have the New Mazda MX-5 latest price Find new car pricelists, new car launches, new car promotions, new car reviews, latest car news & car articles. Read the New.Mazda MX-5 consumer reviews to help you decide on buying a car. Also join our car discussion and forum discussion for car reviews, motoring news & motoring guides. Visit our partner sites who have job openings for Singapore jobs, Singapore classifieds, mover and real estate properties for sale.